As part of the inaugural 2016 Cape Ann Plein Air Festival, the “Paint Essex Paint Out” encompassed a considerable area of this Northshore town. 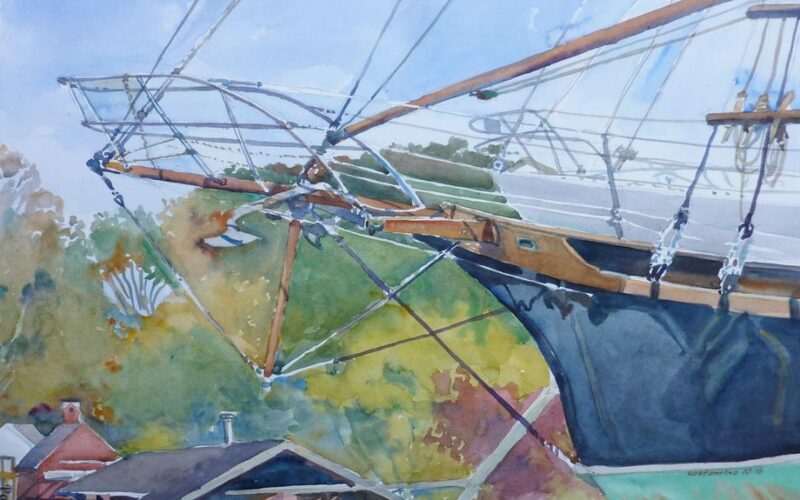 With about 60 national and local artists painting on or near the Essex Maritime and Shipbuilding Museum, I found the bowsprit of a large sailing craft intriguing, and it offered this artist a tracery of rigging and railings and edges that seemed magical with fine lines, shiny surfaces and similar shapes. The delicacy of the foreground rigging overlapping the apparently large shapes of the buildings and mass of scenery provided a reversal and contrast of scale elements. Showing only a portion of the bow and hull against the background of sky, trees, and museum site created a powerful dynamic to the composition. The triangulated negative space between the rigging and bow is mirrored in reverse by the positive triangular shapes of the background buildings. The slick, reflective paint surface of the black hull also provided a weighted shape to anchor all the rigging’s tracery. The half-sheet size piece was completed in about 4 hours on a Lana Hot Press paper.